A few photos from the morning of gorse clearance on 28th October 2018. Some good honest exercise (combined with coffee and chat of course). A mild January day found the Lynchmere volunteers fighting the good fight against invasive species on Stanley common. Finally we remembered to do take a proper before and after photo. Indeed, this time we got panoramic photos and even a time-lapse of the mornings exertions. Thanks to Roy for organising and Judy for keeping us refreshed. Ok, so the timelapse camera decided it wasn’t up for working on a Sunday morning but here is a before and during photo as a placeholder. Next time there will be a timelapse! Summer in the South of England is often referred to as two sunny days and a thunderstorm. We had the sunny days but despite the black clouds the promised thunderstorms did not materialise. With no rain forecast for a week we decided to make hay on Roundabouts field a 10 acre traditional wildflower meadow. Of course the forecast changed again as soon as the grass was cut so it became a race to make the hay and bale it before the rains came. Virtually all of the traditional meadows and pastures that existed across England 60 years ago have vanished as advances in technology and crops have changed the way the land is farmed. As well as bringing us plentiful and cheaper food this does have consequences for the environment and makes the fields on Lynchmere Ridge owned and farmed by the Society an important local resource. We make hay on the meadows for two main reasons. The first and most obvious is to provide winter fodder for the herd of rare breed cattle that graze the commons and fields over the year as well as selling to local small holders and stables which helps to defray the cost of making it. The second and arguably the most important reason is slightly counterintuitive. By cutting the crop of hay and removing it we reduce the fertility of the soil. It’s this reduction in fertility and the associated grazing for limited periods which allows the wild flowers to compete and provides space them to germinate. This increases the biodiversity (number of species) of the plants in the meadow and prevents grass and invasive weeds from dominating the sward. With a wider breadth of plants flowering for longer during the summer the meadow can support a huge range of butterflies, bees and insects. These act as pollinators for seeds and fruit all over the local area as well as atrracting a wide range of birds. It was good to see swallows flying acrobatically across the field as we baled the hay. Making hay in the meadows continues a tradition that has been long established in the community and conserves the landscape as well as playing a small part in stemming the reductions in biodiversity and quality of the environment around us. Since Eva and Garry Venny left us to pursue their smallholder interests and a less frantic life up in the borders there is something of a vacuum for posting on the Lynchmere Commons blog. I will try to fill the gap by posting some photos of the commons as we go about our work. Now it’s the nesting season we won’t undertake a lot of work and the organised volunteer tasks won’t start again until September – but you will find us pulling bracken – do feel free to join in – and cutting with scythes and the grass is growing in the meadows. We will have work to do but as it’s often weather dependent – giving a lot of notice isn’t always possible – so do keep an eye on the blog – and I will post when we do get some warning! Bracken, bramble and gorse. 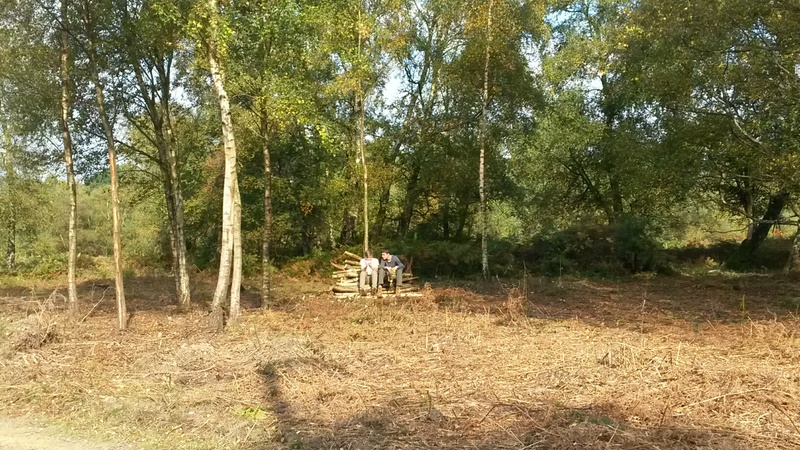 Today we carried on with clearance work along the wheelchair access path on Lynchmere Commons. The lovely day brought a good turnout of volunteers and as you can see a couple of our Duke of Edinburgh volunteers had a rest enjoying the sun after they cleared all that area – well not quite but it certainly looks like that. As always our thanks go to all the people that give up their sunday morning to help with improving our commons. Once again it was time to tidy the community orchard and have a bit of a get together. We were hoping to have a bit of an apple tasting as well as the apple trees had finally reached the stage when we could let them fruit freely and this year they had a good amount of apples on them. Note the use of the past tense! Alas there were maybe a dozen apples in total on over 30 trees! Now it seems to me a sad sign of the times when a whole crop of apples can disappear from one week to the next as seems to be the case here. It seems even more sad to have to think about what we will have to do in order to avoid a repeat of this ‘disappearing act’ next year. Despite this disappointment our volunteers – and special mention should go to our DofE volunteers – wielded scythes and rakes, pulled bracken and nettles and attacked the bramble creeping out of the hedge, leaving the orchard looking better than ever. Our thanks to you all and maybe next year you will be able to enjoy the fruits of your labour – excuse the pun.